Our Fluted Lightweight .22LR barrel is an aftermarket replacement for the 10/22® barrel. This is a fantastic 2 pound barrel to slip into your 10/22® rifle. 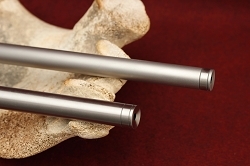 This lightweight bull barrel design is unique due to the singular construction of the barrel, breech to muzzle. 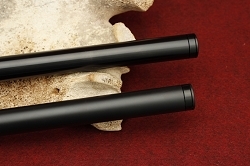 Then we sleeve the barrel with a black or silver anodized tube to give it a bull barrel look, along with an extremely rigid and durable construction. This innovation in the .22 barrel gives it unparalleled accuracy in this weight class, guaranteed accuracy of 1/2" at 50 yards. As an aside, if you are looking for an even lighter lightweight .22 barrel, we offer the Ultra Lightweight barrel. The Kidd 22 Fluted Lightweight barrel has a bull diameter for the first two inches and then steps down to .870 until the muzzle. The bull barrel channel of .920 barrel channel works perfect for this barrel. The 18" barrel weighs 2 pounds and the 16.5" barrel weighs 1 pound 14 ounces. Our muzzle threading is 1/2"-28 and is available with a protective cap or muzzle brake. We believe these are the finest barrels on the market, each one is HAND LAPPED. Our stainless steel barrel is bored and rifled by Lothar Walther in Germany. Tony Kidd then performs all the final machining to make our match barrel a worthy KIDD product. 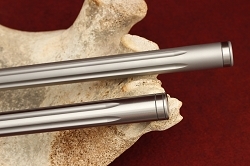 A proprietary chamber reamer is used to ensure the cartridge and bullet feed smoothly. Our barrels are chambered to accept .22 LR ammo and have a 1:16 twist. The unique convex extractor slot eliminates extraction problems by ensuring the extractor is always in perfect alignment with the case rim. Why doesn't everybody use this extractor slot? Because the tooling is very expensive and requires tolerances be held very close for proper machining. Each barrel receives an 11 degree crown. I bought this barrel for my first build. I installed it in a stock Ruger receiver with a KIDD scalloped bolt. I had already purchased a non-KIDD trigger assembly (last product that won't come from KIDD)and when I put it all together I can cover 10 shots with a dime from 50 yards. Nice fit, very light, absolutely beautiful finish, and mates up to my Silencerco suppressor perfectly. This barrel is well worth the money. Excellent Barrel. Opted for the threaded LWB, now the squirrels have no chance. Bullet goes where I aim. I'd been researching barrels for my 10/22 since the factory barrel just wasn't good enough. I'd never heard of Kidd barrels before but the name kept coming up in my searches. I bought the 18" lightweight Kidd barrel and couldn't be more pleased with it. It makes my 10/22 the most accurate gun I have (within the realms of possibility for .22 LR ammo) and super fun to shoot. I was extremely impressed when the parts began showing up. Customer service was great, as I don't always pay complete attention when ordering..... Once the rifle was assembled, I knew I made the right decision with Kidd; this thing was sweet. Very accurate. I bought this back in December of 2016 for my father for his rat (ground squirrels) and high speed long eared rats (Jack rabbits)gun. The average range for a ground squirrel is 45 yards with a target the size of a quarter. He shoots head shots on jack rabbits consistently at 75 to 80 yards. His accuracy has improved by at least 50% to 75% from a competitors barrel he had on it and is half the weight. It is every bit as accurate as my KIDD stainless bull match barrel. At 50 yards using old Winchester hollow points his group can be covered with a quarter easily. Been putting off a review for awhile now, but began a new build few days ago and had to put this out there. I purchased this barrel as part of my 14 yr. old granddaughters first "real" 10/22 build and phenomenal is my opinion. She manages better than 1/2" @ 50 yards. Definitely made me a new lifetime range partner. Keep up the great work guys! This barrel easily gives me one ragged hole at 50 yards, and very respectable groups at 100 yards. The quality and craftsmanship are superb. I will stick with Kidd barrels for all my 10/22 projects in the future. This was my first Kidd barrel I bought for my 1022 build I use the rifle in a 22 league and it doesn't disappoint could not ask for better accuracy it makes me look better than I am. 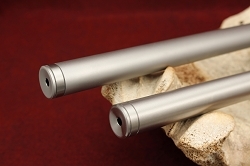 Q: If I order this barrel in silver with the muzzle brake, will the muzzle break match the aluminum slip or will it be stainless like the core of the barrel? Q: I have a stock that was cut for a Kidd bull barrel but switched to a new stock. Now I want to build a new Kidd setup and was wondering if the sleeved bull barrel is .920 the whole length or just the first couple of inches as you description says? I need to fit in the channel that was already cut for the stock and don't necessarily want to go back to the heavier .920 bull barrel again. Q: Is it safe to shoot CCI stingers in this barrel? I don't want to damage anything or diminish the barrel's accuracy in any way. Thanks! Q: If you choose just the "16.5 Black" option is the barrel still threaded? 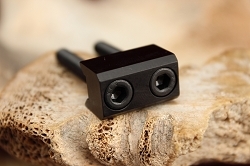 Or do you have to choose the option with the thread protector or Kidd muzzle brake to get the threaded barrel? I have a muzzle brake I just need a threaded barrel. Q: Building a Zombie gun from an old 10-22. I have thrown everything away except the receiver housing. Have replaced everything with your parts. So it's going to have the Hogue over mold stock and nikon scope. So was thinking of the 16" ultra light or maybe the 18" lightweight. Big difference in price for the two inches. is the 18" still a better option for me? Q: Can you use a Hoppes Tornado bore brush in this barrel? Q: Do you have barrels/complete receivers for the Ruger 10/22 22LR Take Down rifle? Q: I bought a Ruger 10/22 and I wanted to change the barrel to this one, would this barrel sit well? Not too tight or not too loose? judging by the fact this barrel is .870 instead of .920 is why I ask. Q: Will the 22LR Lightweight Fluted Alum Sleeved Bull Barrel fit a Hogue YOUTH Stock? Or is that stock too narrow? Q: What barrel do I want for training target, and hunting, adult/young adult /female? Thanks. Q: Are your barrels custom to fit ruger 10-22 standard bolt action stock? Q: Are the thread dept .475 or .400? Asking for use for suppressors such as a silencerco spectrum. A: The threads on our barrels are .400. Q: will this sleeved alu bbl work ok with a 6 oz supressor accuracywise? A: Yes, a 6oz suppressor will be find on any KIDD barrel.